As last year's Paris Motor Show, Smart showed up with the Forease Concept to celebrate its own 20th birthday. This little electric concept depicted what a roofless city car from Smart could look like but didn't look like it had a chance to reach production. Fast forward one year and Smart will bring a new concept car called the Forease+ to the 2019 Geneva Motor Show. You may be asking what is different about the + concept. 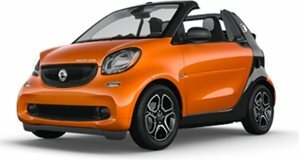 Well, this time Smart has decided to give the car a removable roof, creating a speedster body style. The previous concept would be pretty impractical if, for example, it started to rain. This new car uses a bright orange fabric roof, which the designers call #rooflove. It is constructed from a firm fabric hard shell covered in a textile soft top fabric. When the roof is attached, it mounts within two slots on the rear end, giving it a similar look to a Porsche Boxster Spyder. Don't be fooled into thinking this roof adds a ton of practicality because there is still nowhere to store it in the car when you want to go roofless. Even with a roof, the Forease+ would still be difficult to drive in wet weather conditions because the concept doesn't have any side or rear glass. Smart doesn't quote any power or range figures for this electric concept but we doubt either figure is particularly impressive. This is a city car, so it likely wasn't designed with a 200-plus-mile range in mind. The Smart brand has been struggling in the US, selling just 1,276 cars in all of 2018. The switch to building EVs doesn't seem to have had a significant impact on sales, meaning we may be waving goodbye to Smart in the next few years. The Forease+ shows the brand can still build some interesting concept cars but we don't see how it can reverse the company's fortunes.